Well, what can I say? I had the goose study of a lifetime today. Jason Bailey, a new EOB client, also has the patience of Job. We both enjoyed good, long looks at subjects and had no aversion to the strong wind and cool temperatures. We were an awesome goose-finding team! 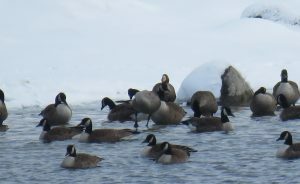 A five-goose-day is a great achievement in eastern ON, but a six-goose-day is a true rarity; a once-in-a-decade achievement! We tallied six species today, all along the river, making the accomplishment even sweeter. GREATER WHITE-FRONTED GOOSE: I tallied an adult among Canada Geese at the east bridge of Long Sault Parkway. It was quite dark throughout, with a bright orange bill and extensive, contiguous black “slash” marks to its belly. The emarginations throughout its upperparts were thin, leading to a dull-backed look. The flank line was quite narrow, as well. 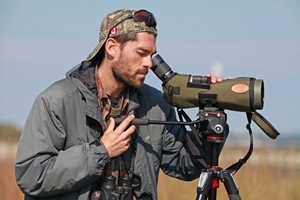 To my eye, it conformed to a Greenland bird by appearance, with the location of the sighting and weather pattern preceding the sighting also factors in the tentative subspecific determination. It was resting near a rock on the N shore, approximately 300 m E of the bridge. 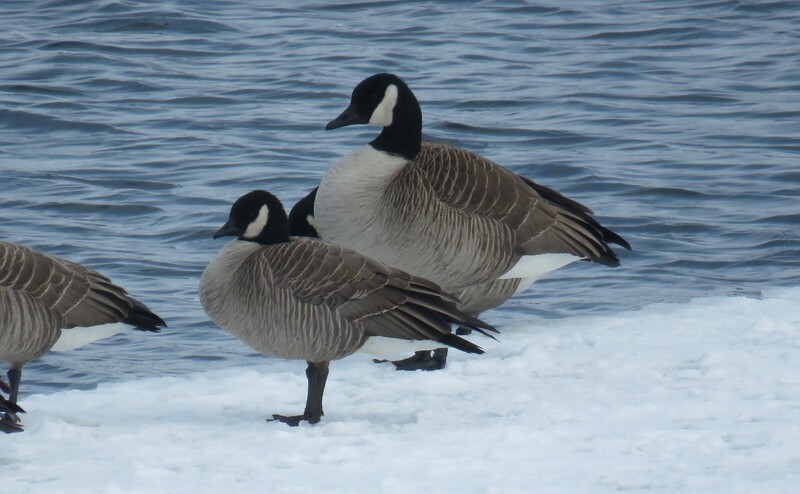 CACKLING GOOSE: Two “Richardson’s” were also at the east bridge. Two others were observed with Canada Geese at Farran Bay park. ROSS’S GOOSE: Four adults were among Snow Geese, seen from Lakeshore Drive (County Road 4) at Flagg Road. BRANT: I was amazed to locate an adult Brant roosting among Canada Geese just off Highway 2, at Galop Lane. This location is approximately 3 km W of Iroquois. 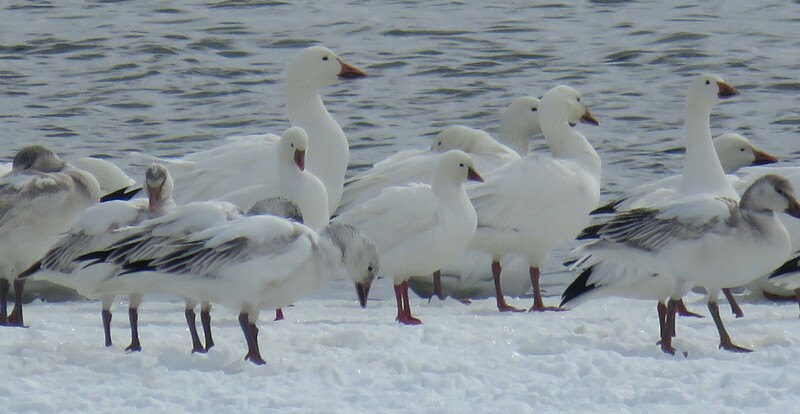 SNOW GOOSE: Concentrated along the river at Lakeshore Drive at Flagg Road. Photo: The rarest bird of the day: a winter Brant sighting (small goose at centre)! This sighting is approximately two months before the passage of this species through eastern ON. Winter Brant sightings are absurdly rare; just check eBird. I was shocked. Photo: Greater White-fronted Goose (the orange-billed one) resting on the shore. Note the white to the front of its face.